Make sure your propane tank (and any other cylinders) is painted with a light-reflecting color. This will help keep the temperature level of the propane down. Have a list of instructions on how to turn off electricity, propane, and water. Review suggested preparations for conditions such as extreme heat with your propane retailer as well as other utility suppliers. Advise them of any special needs you may have. 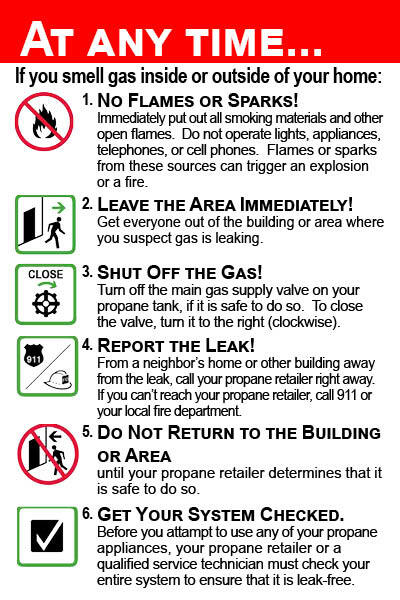 Make sure the area within 10 feet of your propane tank and your propane grill is clear of flammable materials. Remove any debris that is combustible or easily ignited, including leaves, brush, any vegetation, and rags. Cool down your outdoor propane tank by spraying it with a garden hose. By doing so, you can help lower the gas pressure and elevated temperature levels inside the tank. This reduces the possibility of the system releasing excess gas through the pressure-relief valve, its built-in safety feature.